If your loved one is in need of memory care services for Alzheimer’s Disease or another form of dementia or memory impairment, Heritage Pointe of Huntington is dedicated to giving your loved one the care he or she needs. Caring for a loved one with Alzheimer’s, dementia or another form of memory care can be very challenging for caregivers. Heritage Pointe of Huntington has a memory care unit that will provide care and nurture for your loved one in a secure setting. Residents may live in a home-like environment and have structured activities facilitated by staff members who have been trained specifically on caring for those with memory impairments. Stimulating the brain is important for individuals living with Alzheimer’s disease and other types of dementia. Activities that promote positive cognitive support are a staple of our Memory Care unit at Heritage Pointe of Huntington. A sense of security will give you ease. Our Memory Care unit allows for our residents to walk freely, as all main entryways are secure. Our secured courtyard allows those who love the outdoors the freedom to pursue their favorite activities such as gardening, bird watching or just taking a walk to get a breath of fresh air. Difficulty with planning and organizing becomes increasingly difficult for those affected with a memory impairment. Our memory care unit staff have received special training in caring for the needs of those affected by the disease. 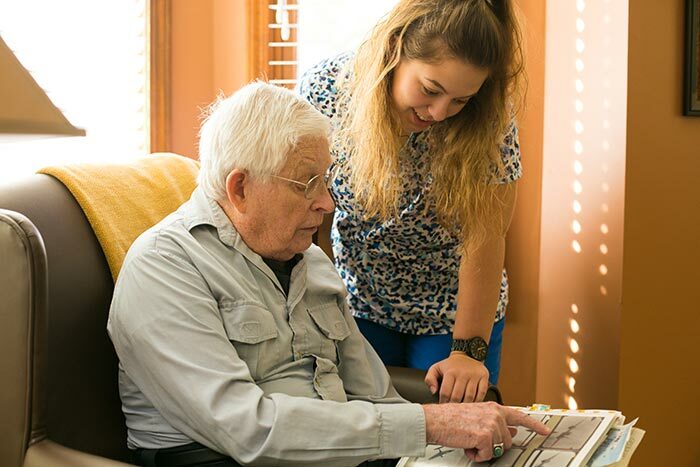 Our team works to develop a personalized plan of care to provide a daily routine to help promote familiarity and a sense of security for your loved one. We would consider it an honor to meet you and give you a personal tour of our memory care unit and facilities. Please call, email or click here to schedule your tour.